A warm coastal welcome awaits at Sanderling, Padstow. Set along the banks of The Camel Estuary with fabulous views across to Rock and Porthilly, this beautiful detached home has been thoughtfully styled and furnished with luxury in mind. Whilst only 12 minutes walk from the hustle and bustle of the harbourside Sanderling is extremely quiet. The house offers a spacious layout for holiday life with large living and dining spaces, a modern kitchen, four generous bedrooms and a charming coastal inspired garden with decked terrace and rear lawned area. One well behaved dog is welcomed. Once inside, Sanderling exudes a cool coastal style from the nautical palette of fresh white and marine blue hues to the relaxed furnishings and spacious holiday layout. Arrive to a beautiful central hallway which leads through into the hub of the house, the open plan kitchen, dining and snug area. With Padstow firmly on the foodie map in Cornwall, enjoy self catering in style as you get creative in the modern kitchen using only the very best of Cornish produce including artisan breads, local meats and of course fresh shellfish plucked straight from the estuary. The dining table can be dressed to impress or offers an informal setting for lunches on the go or family suppers. A quieter relaxed snug area is set away from the main sitting room ensuring a touch of tranquility as holiday life buzzes around the house. The large sitting room is separate to the open plan spaces with ample seating for all, this versatile room can be enjoying in all seasons from cosy afternoons by the fire in cooler months to sunny days as you gather for pre-dinner drinks perhaps. A ground floor cloakroom completes the ground floor. A central staircase leads to the first floor with a collection of 4 large boutique style bedrooms and 3 bathrooms. Each bedroom has been thoughtfully styled with fresh azure blues and soft shades of pink inspired by the breathtaking estuary views. 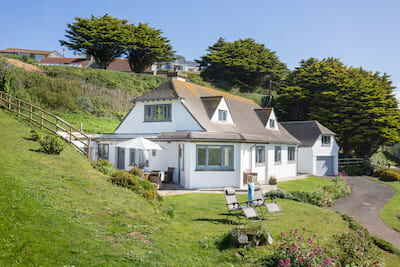 Sanderling, Padstow offers a wonderful outside ambiance with a charming coastal inspired garden. From both the sitting room and the open plan kitchen, dining and snug area, throw open the double doors to the decked terrace complete with large dining table and chairs and a further all weather sofa seating area. From Spring to Summer the garden brims with life and colour from the Cornish Agapanthus to the fragrant lavender bushes which flank the pebbled pathways. To the rear (and accessed from the kitchen) is a raised lawn area and superb place for children to play and explore. Sanderling lies in an enviable location just a hop, skip and jump from the banks of the Camel Estuary and surrounding tributaries including Little Petherick Creek. Wander from your holiday door to the waters edge in moments and capture the ever changing views from low to high tide, follow the Camel Trail either on foot or hire bikes in Padstow and follow the trail as it hugs the water along towards Wadebridge, perfect for all ages and abilities. The harbour of Padstow is a short walk away and has so much whatever the holiday timetable! Hop aboard the Jubilee Queen in the summer months and enjoy a trip out to view the coastline and marine life, take in a fast fun fuelled speedboat ride or simply explore the souvenir shops. If dining out is a family favourite pastime then you really are in good hands, Padstow offers some of the best restaurants in Cornwall including Paul Ainsworth's No 6 or Rojanos, Rick Steins seafood restaurant and bistro or choose an al fresco option of fish and chips on the quay in true Cornish style. The golden sand beaches of Trevone, Harlyn, Constantine and Tregirls area ll well worth exploring or catch The Black Tor ferry over to Rock and walk along to Daymer Bay or even Polzeath. Check in to Sanderling, Padstow and immerse yourself in the coastal way of life in all seasons. The house exceeded our expectations. It was beautifully furnished but also relaxing and homely from the moment we walked through the door. We absolutely loved our stay at Sanderling and would definitely want to book this property again. The house was beautiful and very clean. This was our second stay at Sanderling and the house was just as exceptional as last year. So wonderfully equipped. It's more like staying in someone's beautiful home. We can't wait to return again. Very accommodating, professional and efficient service!!! Sanderlings is a fantastic property. Very well equipped and very well presented. 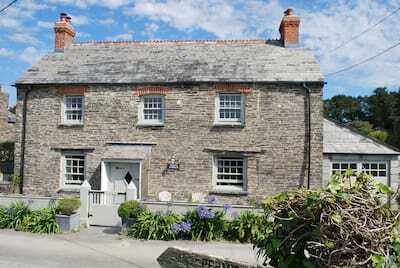 Its location is great, far enough out of Padstow for peace and quiet but just a ten minute walk along the Camel trail in. Just loved it. Sanderling was a great house. It felt very homely, not like a normal rental. Lots of lovely touches. Very child friendly.